Leah Greene, an active ATSiP member. Newsletter - Issue 49 (September 2008). We are very pleased to announce that the winner of the 2008 Psychology Network Technician Award is Leah Greene, a technician / demonstrator for the directorate of psychology at the University of Salford. 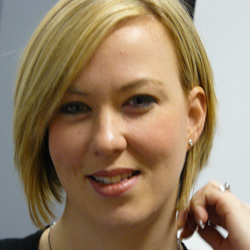 Leah has been working for the directorate for five years, during which time she has provided outstanding support for students in the directorate, including developing Eyetracker, Computer Gaming and Galvanic Skin Response laboratories, and managing the observation suites and a dedicated psychology computer suite. For the past three years Leah has also been involved in delivering and developing seminars for level 1 Introduction to Biological Psychology and level 2 Biological Psychology. Leah is particularly interested in developing innovations to improve the student learning experience. For example, Leah has scanned all of the questionnaires and psychometric instruments that the directorate has acquired (after dealing with relevant copyright issues, of course), converted these into PDF documents, and uploaded them onto the directorate's VLE (Blackboard) so that students have ready access to these materials. Leah has also developed a Technical Information website for psychology students, containing useful information, links, and lists of available equipment. These innovative uses of existing technology have enhanced the learning experience of students across the directorate, who now benefit greatly from having easy and continuous on- and off-campus access to all these resources. "Leah provides exceptional student support across the board. I feel this has been particularly well demonstrated in the way she has lent her expertise to those final-year dissertation students who wanted to try something a bit more technologically ambitious. She achieved exactly the right balance of support by providing direct advice when needed and helpful encouragement for students to learn the techniques themselves". Adam Galpin, Lecturer, Directorate of Psychology. "Leah was extremely helpful and a perfect seminar leader". Student, Level 2 module evaluation. We would like to congratulate Leah on her award, and to thank everyone who got involved with this year's award. Details of next year's award will be available at the end of 2008.